It truly is a rush when you set the hook on one of these aggressive Beasts of the Bayou. The days are getting shorter and the water is cooling off. 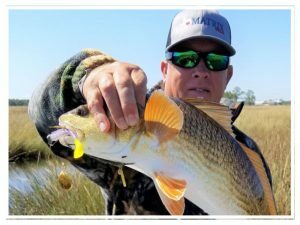 It’s Fall in the Marsh and Bayous, and Red Fish are cruising like submarines on patrol. At mid-morning we silently slip In a shallow pond and the Reds are making short work of crabs and bull minnows over the grass. At this point for me, it’s all about stealth. I’m making long casts and slowing down the lure to just settle on the water past the fish so I can present it right on his nose. Over the past years I have enjoyed chasing these brutes and learned a lot in pursuit of Gold. To be successful you have to to figure out where they are. 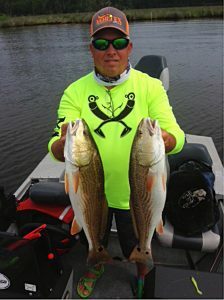 Summertime Reds pattern quite different than in the cooler months. Just like a Man-Hunt for fugitive’s, we spend a lot of time on the water and many hours on Google Earth until we located these guys in the shallow ponds off the main bayous. Now that we located the big Red hide-out, we had to figure out why they are there and when do they feed. I’m of the opinion the ponds are collection points where Crabs, Bull Minnows and Finger mullet hold up as the tide falls. If you can find a shallow pond with a grass bottom that has connecting drains, you’re in the right spot. So what’s the attraction? The grass is like a filter and offers some protection as the tide pulls this food source out of the tall grass and rosa cane. 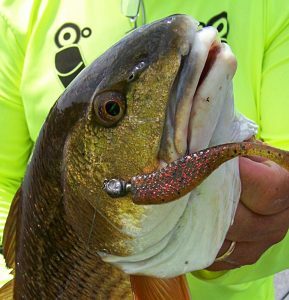 Redfish are opportunity feeders, they will eat almost anything at any time. Being an artificial fisherman I have two strategies that work for me. The first is the topwater lure. 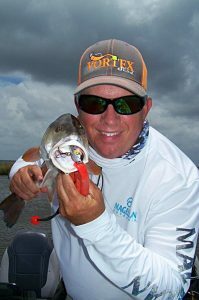 Over the past year I have been very successful with the Matrix Mullet top water bait. It has a distinct high-pitched rattle and is so easy to walk the dog. 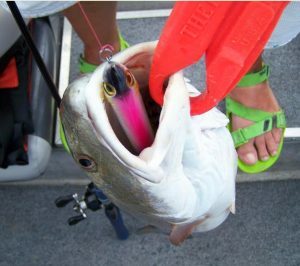 I have had days when the Reds just launch themselves out of the water and inhale this lure in open water. The second part my my strategy is the use of soft plastics. Remember, I’m fishing in shallow grass bottom ponds so I’ve got to go light. One eighth Jig-heads work well. Red’s are bottom feeders for the most part. I want to imitate the food source and to me that’s a Bull Minnow. The two Fall colors I like are Avocado and Green Hornet Matrix Shad. This year I’m pitching the Matrix Craw to points and pockets. I’m also buzzing it over grass beds when sight fishing Reds on clear days. The Matrix Craw produces incredible action on a medium retrieve. The white Craw and the dark blue glitter Craw have been my goto colors. Last, but certainly not least is the Spinner Bait. I use a Spinner bait as sort of a locator bait. Anybody can throw a Spinner bait and for the most part using a moderate retrieve it’s weedless. I like a gold Spinner blade with a Purple Haze soft plastic. This gives me plenty of flash and the chartruse paddle tail provides the action. Whichever bait you choose you need to know where to cast it. In ponds I have found the best results in a target zone eight feet from the shoreline to the middle. Just imagine a circle in this area and cast away. On a falling tide be sure to check the points and curves on pond inlets and drains. Reds will be holding in ambush mode in these areas. It truly is a rush when you set the hook on one of these aggressive Beasts of the Bayou. The strike comes hard and fast like a prize fighter looking for the knock-out punch. Every hook set can produce a fight that you won’t soon forget.